Investors are gaining optimism that the software maker can end the year with solid growth. Business-management software giant Pegasystems (NASDAQ:PEGA) enjoyed a nearly 15% stock-price surge in September, according to data provided by S&P Global Market Intelligence. The rally helped push shares toward a new record high and they remain up by double digits over the last 12 months. 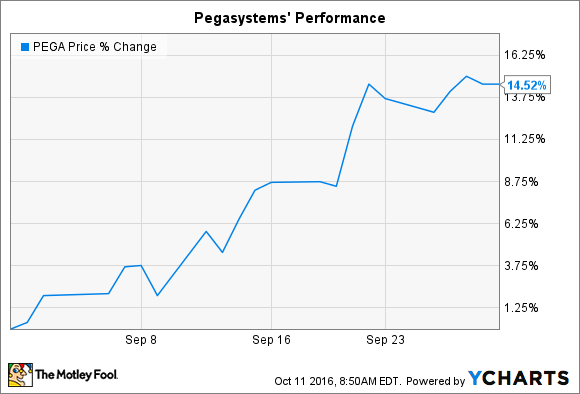 September's rise came as investors grew more confident about Pegasystems' short-term growth prospects. At its last quarterly report, in early August, the company posted steady sales gains and a 25% earnings jump. Both figures beat consensus estimates, but investors focused instead on the fact that order backlog barely improved (rising 4% compared to 15% in the prior quarter). CEO Alan Trefler and his executive team explained at the time that demand could be volatile over the next few quarters due to the timing of a few large client deals and uncertainty around the Brexit vote. Since then, the industry has shown signs of continued solid growth that has lessened concerns of a slowdown for Pegasystems. Software titan salesforce.com, for example, posted a 25% revenue gain for its fiscal second quarter, on par with the prior quarter's gain. Consensus estimates call for Pegasystems to post 15% higher sales when it announces its next quarterly report in late October. That might be a tad below the prior quarter's results, but shareholders shouldn't overreact to that figure since it tends to swing from one period to the next. Looking ahead, investors will be focused on management's reading of the overall market and how the company is positioned within it. In late September, the company finished integrating its OpenSpan acquisition into its Pega 7 platform so that now it offers cost management for robotic workers as well. Trefler will likely discuss how that makes Pegasystems' offering more compelling as the company heads into its busiest season, the end-of-year period when many large enterprises and governments make their key annual purchasing commitments.